The legendary capital of Lycia had always been the most important city of the country. Strabo describes it as the biggest city in Lycia. Xanthos, once the capital and grandest city of Lycia, is located in the Antalya province, 65km S0utheast 0f Fethiye, and 35km northwest of Kaş near the village of Kınık. Xanthos takes its name from the river that flows beside it, the Xanthos, today’s Eşen Çayı. It is a unique archaeological complex, made famous to the Western world in the 19th century by its British discoverer Charles Fellows, who took a large number of the works of art he had discovered back to the British Museum in London. Since 1988 Xanthos is listed as a UNESCO World Heritage Site. Currently there is a French team excavating Xanthos and Letoon, the sacred cult centre of Lycia, located less than 10 km to the south of Xanthos. The early history of Xanthos is unclear: although it is mentioned in early Lycian inscriptions, no Bronze Age remains have been found within the city. Homer states that one of the heroes in the Trojan War, a man called Sarpedon, came from Xanthos. Xanthos reappears in the historical records of the 6th century BC as the principal city of Lycia. The ancient city was twice besieged and destroyed: in 540 BC by the Persians of the Achaemenian dynasty and in 42 BC by the Romans. We started our visit in the city’s main centre, the Lycian acropolis that rises straight up from the bank of the river Xanthos. The oldest ruins are located on the acropolis. Among those ruins are Lycian houses and city walls dating back to the 5th century BC as well as the foundations of a large structure consisting of many rooms, probably a palace that was destroyed by the Persian general Harpagus. Located immediately to the north of the Lycian acropolis is a mid-second century Roman theatre that was built atop a pre-existing theatre of the Hellenistic period. The tiers of seats are in a fairly good state of preservation. The stage building is still partially standing and was once of two storeys and decorated with columns. The orchestra, full of stones from the stage building, is accessed from the east through a vaulted parados (entrance corridor). The theatre had a capacity of 2,200 people. On the west of the theatre are two famous, magnificent Lycian monumental tombs standing side by side. These two monuments are the symbol of Xanthos. The first of these, which is 8.8 metres high is known as the Harpy Tomb. This is thought to be the tomb of Kybernis, a warrior king of Xanthos. Kybernis led the Lycian ships in the Persian invasion of Greece. Dating to approximately 480–470 BC, the chamber topped a tall pillar of dark limestone and was decorated with marble panels carved in bas-relief. This chamber is covered at the top with a stone slab. The reliefs now seen in their place at Xanthos are plaster copies cast from the originals. The carvings were removed from the tomb in the 19th century by Charles Fellows and taken to the British Museum in London, where the reliefs are now on display. Next to the Harpy Tomb is another tomb of a somewhat different type. The monument dates to the 4th century BC. It consists of a pillar made of large stone slabs covered by a three-stepped roof, with a Lycian-style sarcophagus at the summit. The most important ruin in Xanthos is the inscribed Obelisk, situated behind the north portico of the agora. The monument, dated 425-400 BC, is an inscribed monolith, currently believed to be trilingual, rising atop a two-stepped krepis. The three languages are Ancient Greek, Lycian and Milyan (the last two are Anatolian languages) and give important information about the period’s history. According to the inscription, the monument was erected to commemorate the battles and victories of a Lycian prince named Kherei. Upon entering the city, at the foot of the acropolis near the south gate, an archway is dedicated to the Emperor Vespasian who reigned from 69 to 79 AD. A little further north of the gate, one can see some stone blocks of a podium, all that remains in situ of a famous heroon in the form of a Ionic temple. This building is known as the Nereid Monument. Almost all of the rest of the monument, dating to circa 400 BC, is now in the British Museum. The heroon took the form of a Greek temple on top of a base decorated with sculpted friezes, and is thought to have been built as a tomb for Arbinas, the Xanthian dynast who ruled western Lycia in the early fourth century BC. Between the columns are three statues that have been identified with Nereids (water goddesses), from which the monument takes its name. The rich narrative sculptures on the monument portray Arbinas in various ways, combining Greek and Persian aspects. To the East of the Lycian acropolis are the ruins of a recently excavated Roman colonnaded street, 12 metres wide. It once lined with shops on both sides, shaded by porticoes. This road (decumanus), running north-south, intersects with the main road (cardo). At the southeast of the excavated road are the remains of an arcade of shops and a Byzantine Basilica built over an earlier Roman temple, to the east of the Lycian acropolis. Magnificent mosaics have been found in the basilica (now covered and protected). 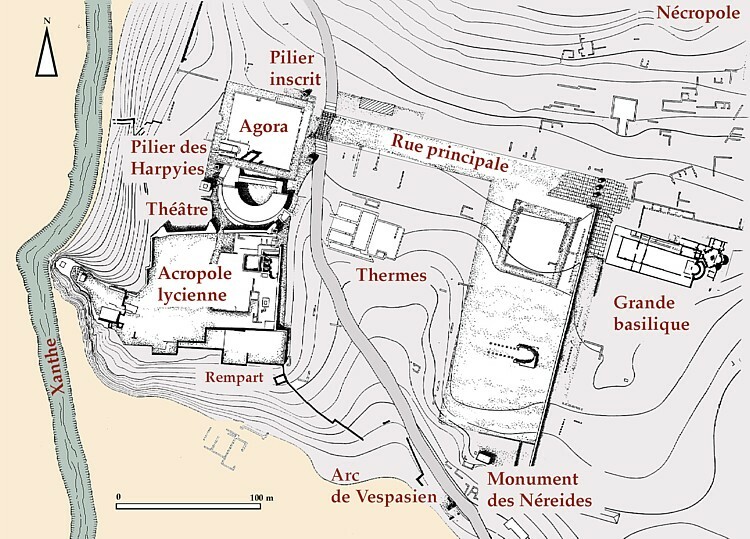 An agora was built on top of the shops in the Roman/Byzantine period. Several rock-cut tombs and monuments standing side by side in the south-east corner of the acropolis present an impressive sight. Further to the east, there is the Dancer’s sarcophagus dating from the 4th century BC. The long faces of the sarcophagus’ lid are decorated with battle and hunting scenes, while the lid’s two narrow faces show two women dancing. This site was the location of Lycia’ oldest tomb usually known as the Lion Tomb, but sometimes mentioned by the name of its owner, a certain Payava. Today, all that can be seen of the tomb in situ are its foundation walls; the upper portions of the monument are now in the British Museum. Hadrian visited Lycia twice, in 129 and 131 AD. He believed in strengthening the Empire from within through improved infrastructures and commissioned new structures, projects and settlements on his many travels. In Lycia, he founded the building of huge granaries at Patara and Andriake (the harbour of Myra) and at Phaselis numerous buildings and statues were erected in his honour. More on Xanthos and its history is available on the Livius site. 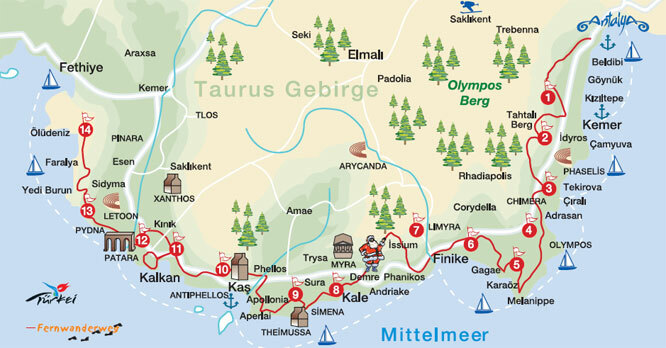 Xanthos is on the Lycian Way, a long-distance footpath along the Lycian coast. It is approximately 510 km long and stretches from Ölüdeniz, near Fethiye, to Hisarcandir, about 20 kilometers from Antalya. According to the Sunday Times the Lycian Way is one of the ten most beautiful long distance hikes of the world. Further photos can be viewed from my image collection on Flickr.